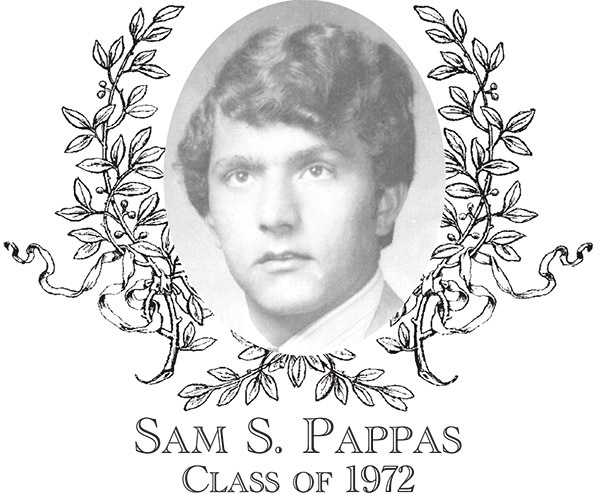 Sam S. Pappas, Class of 1972, was one of the major contributors in starting the soccer program at Bartlett High School in the fall of 1968. A stand out in the sport, Sam's foot skills, field awareness, and scoring ability made him one of the most talented soccer players in the area and in the school's history. Sam was a standout on the inaugural team his freshman year and subsequently was named the MVP. Sam would miss his sophomore season due to an injury, only to return the following year to be awarded the honor of MVP once again. In his junior year, Sam amassed 20 goals and 15 assists during an undefeated, 12-0 regular season. He helped lead the charge in their return to the Western Massachusetts Tournament's Championship Game. The team�s record of 13-1, a .929 winning percentage, still stands in the school�s history as the program�s best. After graduating Bartlett, Sam went on to play soccer at Nichols College for four years and was named Captain in both his junior and senior seasons. Sam's passion for the sport of soccer launched him into coaching future generations of players in Webster, having brought the sport to the town decades earlier. Sam coached for Webster Youth Soccer for over 20 years and at the Premier Level for seven. He also returned to his Alma Mater to coach both the Junior Varsity (1994-1997) and Varsity Soccer Teams (1998-2001). Sam is a Certified Public Accountant working out of the firm he established. He and his wife Evelyn reside in Webster. They have three children, Stephen, Chuck, and Jimmy and five grandchildren.